Our cat Patches is an odd mixture of paranoia and sweetness. She’s sure that every thing and everyone is out to get her, but she is convinced that I am her Mama. It’s a pretty cool gig. Dang these sound good! Reblogged from shirleysheaven.wordpress.com. 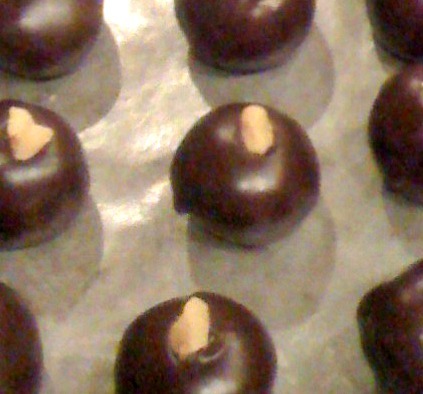 As promised, here is Shirley’s secret bourbon ball recipe I wrote about in my recent Writing 101 post. • Drain nuts, reserve bourbon. • Soften butter and mix with confectioner sugar. • Mix in nuts; add in a tablespoon or 2 of bourbon until you can make balls that will hold together. • Roll mixture into about 3/4″ balls, putting a toothpick into center of each ball immediately. Enjoy this video of my nephew, Beto and his business partner, Dan. Then start thinking about a trip to Hobbitenango! Blurry photo of a medium sized turtle. I spoke to him and he scurried back to the safety of the forest. What might our guests see? And for many life is hard. Author nananoyzPosted on April 19, 2015 April 17, 2015 Categories Haiku, LifeTags architecture, Guatemala, haiku, poetry, poverty, ruins, Third WorldLeave a comment on Third World? I feel the need to clean something–anything, but preferably something that isn’t too dirty. Creative urges are tugging at my heartstrings. I picked up a knitting instruction manual, yarn, and two art prints at the farmer’s market this morning. I’m actually going to organize at least one closet this week. Maybe. Love is in the air. Love of napping, that is. Songbirds are busy competing for mates. Studly made three trips to Lowe’s in one afternoon. Winter clothes get put away. Of course, in Florida that means I’ve traded my capris and tees for shorts and tanks. Teachers begin seeing the light at the end of the tunnel. Much drinking is done. From the beauty of nature’s ways? How do we return the favor? Appreciation for the gifts we’re given. Will you stop, I wonder? I spent quite a chunk of the past 48 hours worried that my son and daughter-in-law hadn’t made it safely home from Guatemala. They’d stayed to hike one of the volcanoes, and instead of flying home to the U.S. on Sunday with the rest of the family, they had plans to fly out on Wednesday. The last message received was a Facebook post saying they were enjoying a final meal in Antigua on Tuesday night. Then nothing. So last night I began texting. Nothing. This morning I began calling. Nothing. Following that final Facebook post my son was knocked senseless in trying to thwart a kidnapping attempt on his wife. The kidnappers had my daughter-in-law and had taken my son’s phone, identification, passport, and all of his money. When he awakened he had amnesia and was wandering around Antigua begging for spare change. I called the airline and learned that the couple had boarded their flight. Of course then I wondered if perhaps someone had stolen their passports and flown home in their stead. There was no rest for me until my daughter-in-law’s sister sent a message saying the couple had returned and were thoroughly buried under piles of makeup work. Now my imagination is working on ways to torture my son for not getting in contact with me. Let’s see, thumb screws ought to do the trick. This was the photo I could have shared with the authorities. Daughter-in-law Liz with Fuego in the background. Son Jason holding up thumbs for the torture device. Grumpy Cat and I are on the same page. There’s nothing like letting a bunch of memes do the talking for me. You cradle me with skill and grace. When my clock sounds strident alarms. For sound asleep I’ll gladly stay. I have the perfect day all mapped. To eat a bite for my health’s sake. Snuggled deep in blanket’s nest. When my eyes droop I’ll sleep some more. Having spent my day being oh so lazy. Just know you’ve a special place in my heart.